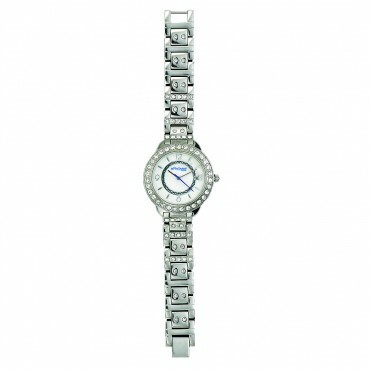 Silver bracelet watch with square links accented with rhinestones the length of the band. The stainless steel case is trimmed in a circle of bright, clear crystals around the bezel. The mother-of-pearl face features silver markers at each five-minute interval around a silver circle etched with antiqued western style filigree and the signature Montana Time logo. Narrow silver hour and minute hands. Jewelry clasp.